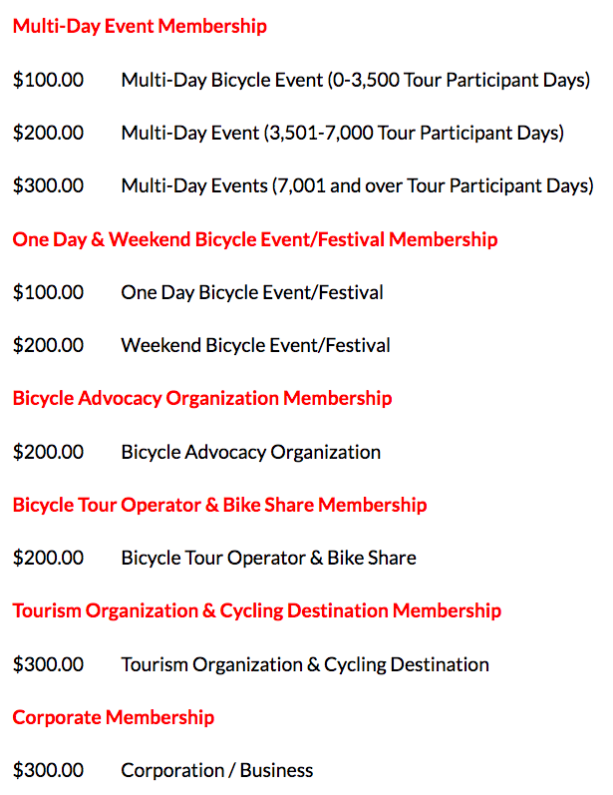 *TPD = Tour Participant Days, the total number of riders times the number of days of the ride. As a Member, you have the opportunity to place banner web ads on the National Bicycle Tourism Conference website (http://www.bicycletournetwork.org/) and the Bicycle Tour Network website (http://biketournetwork.com/) Banner Web ads (300 horizontal x 250 pixels) have a direct link to your company’s web site. Listing of one cycling tour on www.bicycletournetwork.com, searchable by geography, calendar, or master list. This listing includes Tour Name, Tour Dates, Tour Location, Tour Description, Contact Information, Website and Email Links and a Tour Photo. If you would like to download a PDF of the 2019 BTN Membership Application, click the link. This is for new members or returning members.